With an estimated population of 1.708 billion living within the time zone, roughly 24% of the world population, it is the most populous time zone in the world, as well as a possible candidate for ASEAN Common Time. This time zone is used in all Chinese-speaking countries, giving international Chinese websites and TV channels the same time. The southern half of Vietnam (Republic of Vietnam) was formerly part of this time zone prior to the national reunification on 30 April 1975, making it 1 hour ahead of North Vietnam. After 1975, the whole country came under the North Vietnamese time zone, UTC+07:00. This section is only partly updated for Russia which had the latest time zone changes in 2016. This concerns areas within 112°30′ E to 127°30′ E longitude. Parts of Indonesia, including eastern East Java with its capital city Surabaya, most of Central Kalimantan, and eastern part of West Kalimantan, where UTC+07:00 is used. East Timor, where UTC+09:00 is used. The western parts of Korea, including the South Korean capital city, Seoul, where UTC+09:00 is used. Parts of (north)eastern China including the eastern half of Heilongjiang Province and the Yanbian Korean Autonomous Prefecture in Jilin Province. 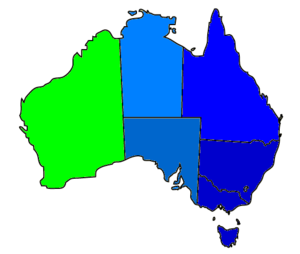 Easternmost parts of Western Australia. Western part of Sarawak, including its capital Kuching. Peninsular Malaysia, where the nation's capital Kuala Lumpur is located. Most of central Mongolia including the capital Ulaanbaatar. most of Xinjiang Uyghur Autonomous Region (although many locals set their clocks at UTC+06:00 even if it is officially UTC+08:00, in any case work and shop schedules are two hours after Shanghai and Beijing). See also Time in China. Parts of western China including western Xinjiang province (although most locals observe UTC+06:00 even if it is officially UTC+08:00).